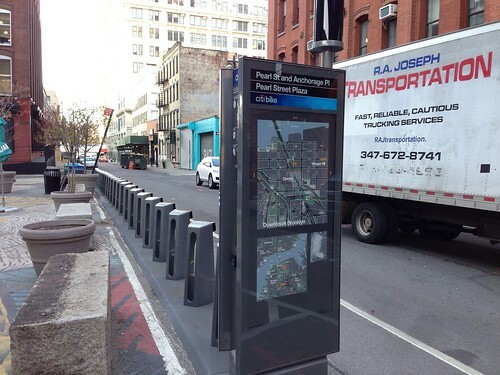 As City Hall prepares to roll out bike share, New Yorkers are bickering over dock placement. There’s a more pressing topic: saving lives. Three people died in Paris’ first year of bike share. New York should heed Paris’ lesson. Bike share will be a big deal. If each rental bike receives three to five daily uses, anywhere from 16,500 to 27,500 new riders will add themselves daily to the 31,359 cyclists in core Manhattan now. The city has a special responsibility to new cyclists — because it’s putting them in relative danger. Sure, cycling is safer than it once was. In a decade, as bicyclists’ numbers have quadrupled, annual deaths haven’t risen. Paris’ program is very popular—but three died in its first year. But that’s still 18 people dead last year, including three in Manhattan. Bicyclists made up 6.5% of people killed in New York crashes, far more than their 1 percent share of people coming into Manhattan by subway, bus or car. 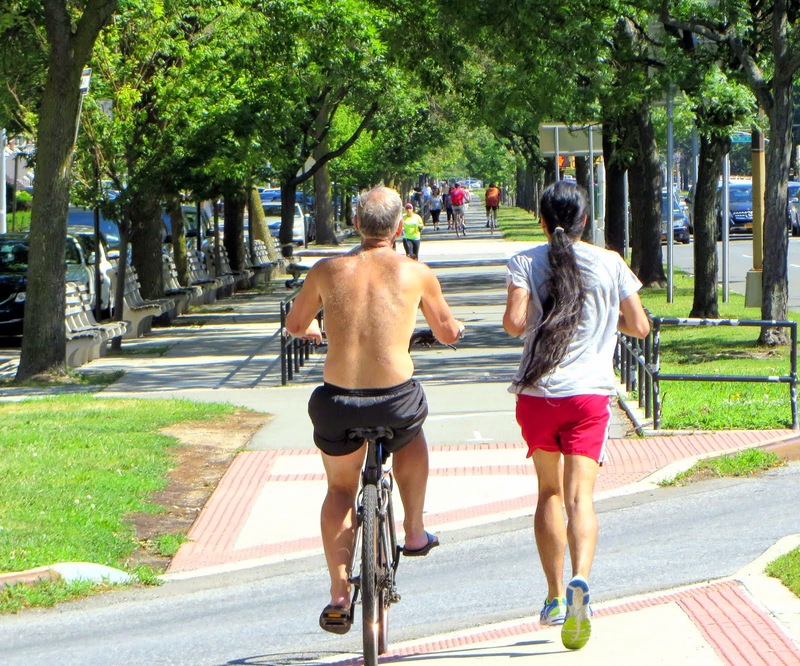 More cycling can make riders collectively safer, by increasing awareness by drivers. But it doesn’t make the individual Citibiker safer if she was doing something far safer — like riding the subway — before. Yes, London, Washington and Boston have had bike share for couple of years — with no deaths (although London had a critical injury last month). But Boston and Washington have a fraction of Manhattan’s population density (and expected bike usage). Core London, too, is less dense. The city closest to us is Paris, with 81% of our population density. You’ll often hear that bike share in Paris — or “Velib,” for liberty on a bike — has been a hit since its summer 2007 launch. True enough: Go to Paris, and you’ll see older ladies in skirts pedaling with their purses in their baskets just as often as you see thirtysomething males. What you won’t hear is that Velib had a gruesome rollout. Ocean Parkway and Avenue Z is less than 2 miles from the 13.1 mile finish on the Coney Island Boardwalk. Shoe rubber replaced tire rubber for a successful event sponsored by New York Road Runners. More on the race and more photos coming soon. The 478-acre site is celebrating its 175th anniversary this year with an exhibition opening Wednesday at the Museum of the City of New York. While it cannot replace a visit to the cemetery grounds, "A Beautiful Way to Go: New York's Green-Wood Cemetery" provides historical context for one of only four U.S. cemeteries to be granted National Historic Landmark status. Founded in 1838 in what was then the City of Brooklyn, Green-Wood was an early example of the "rural cemetery." In contrast to the somber church graveyards in lower Manhattan that were rapidly filling up, it offered vistas of the New York Harbor and a new view of death that essentially said: "If you live a good life, this is the kind of afterlife you will have. It will be a place like this," said curator Donald Albrecht. New bathrooms rise in #Coney Island or a new home for E.T. So what if E.T. really did become stranded on Earth and had no way to go home. We couldn't expect him to survive in a homeless shelter or ride the Q train 24/7. But suddenly these alien pods appeared on the Brighton Beach and Coney Island boardwalks. Talk about affordable housing for our E.T. friend. At a mere $2 million dollars for each pod it's perfect. He will have a ramp to shuffle up and down. He can bathe in the ocean. Each one features skylights and extensive natural ventilation, with solar panels on their roofs to generate power. Our E.T. will live in luxury. Alas, these pods that come straight of The Lord of the Rings will not house our esteemed friend. These structures are toilets complete with, I guess, the most sophisticated indoor plumbing system and built high off the ground to withstand the next storm surge which all weather futurists predict. Anyone doing their business here should sit in awe of the modern miracle. But if the ramp is too long I don't know if I will make it in time. And if the bathroom purpose doesn't work out as planned it can always be used to house surface-to-air missiles. Morning rain didn't keep workers from getting the new bathrooms ready for the first flush. Ocean Parkway has never been so peaceful and safe even with thousands of #marathon runners shuffling down to Coney Island. Even the sound of a motorcycle engine or random horn could not disturb the idyllic atmosphere. Wth the incessant traffic you don't even know that there were hundreds of birds in the hundreds of trees that lined the route. But listen carefully. “He went up and the next thing you know, [15 minutes later] there’s three or four police going up after him,” said Cyquan Smith, 19, of Baychester. Formerly a refuge for homeless and derelicts, the park recently underwent a beautiful restoration via a $2 million grant that the residents fought hard for and won. As part of the beautification of the park, one area at the tip of the park was specifically dedicated to public art shows. Several works have been exhibited. Click on link for views from the top. NEW YORK — A crane has hoisted a U.S. flag covered spire to the top of New York's One World Trade Center, under construction at the site of the Sept. 11 attacks. Construction workers applauded as the upright spire began heading skyward at midday Thursday on its way to the roof. The spire's temporary home will be a platform at the top of the trade center. When it's fully installed, at a later date, it will soar to a symbolic 1,776 feet. The 408-foot spire will be used as a world-class broadcast antenna. The new tower is at the northwest corner of the trade center site. The area is well on its way to reconstruction with the 72-story Four World Trade Center and other buildings. Mermaid Parade in danger, launching Kickstarter IT IS WORTH SAVING! Coney Island beachgoers will have to hold it a little longer for four new sleek prefabricated bathrooms. The nearly $2 million modernistic comfort stations set high off the ground were slated to be delivered from Berwick, Pennsylvania Thursday. But those plans have suddenly been put on hold, a city Parks official said, declining to elaborate further. “I do not have a new tentative date,” Parks Dept. spokesman Arthur Pincus said. 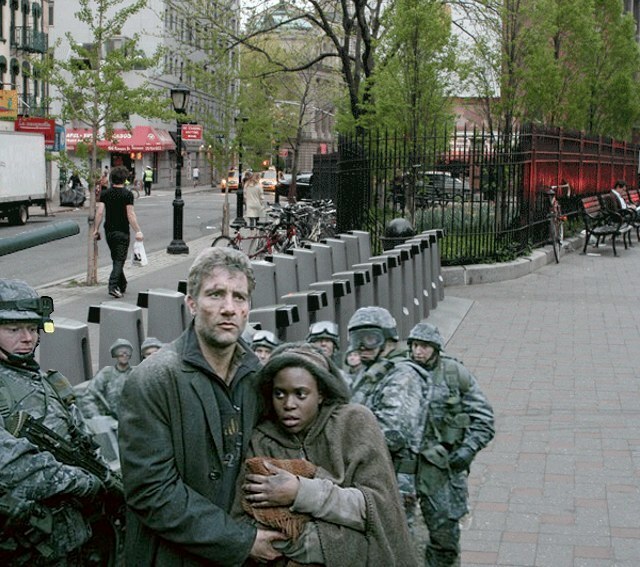 Brooklyn was slated to be the first borough to receive the futuristic comfort stations, which were going to replace bathrooms destroyed by Superstorm Sandy. Citywide, 35 modular units will be installed at 17 locations at a total cost of $105 million, Pincus said. The modulars will also include lifeguard stations and offices for parks security officers and staff. The stations were welcomed by one of the city's biggest critics from the area. 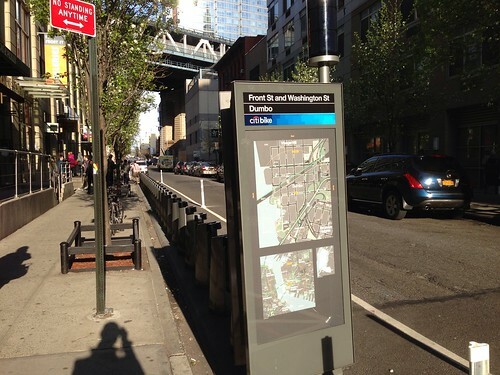 First Citi Bike came for the parking spaces, and we did nothing. Then they came for the parked cars, and some of us paid $250 cash to get our wheels back. Now they're coming for the bicycles, and IT'S WAR. In the greatest of ironies, some residents in Battery Park City are up in arms because Citi Bike is going to get rid of their bike rack. 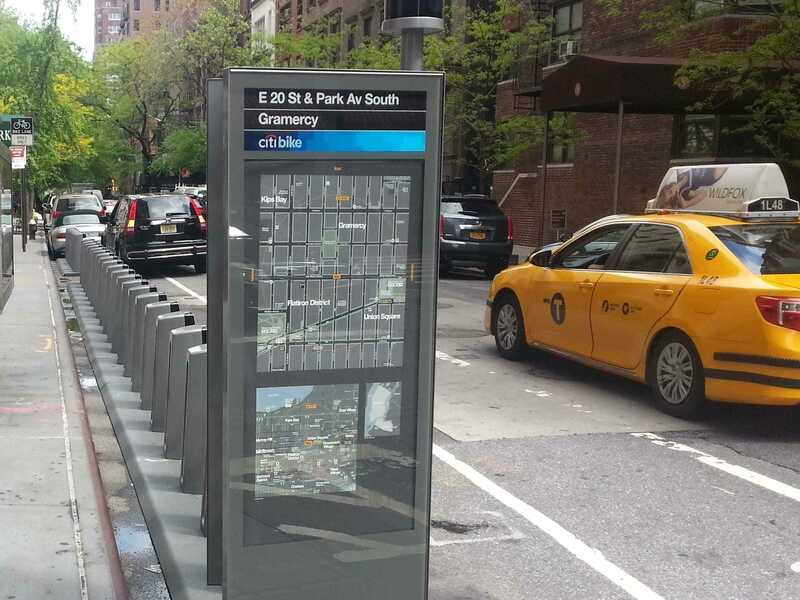 Shelly Mossey, a longtime cyclist who owns the cargo bike delivery company Urban Mobility Project, tells us Citi Bike has promised to cut the locks of any bikes left attached to the bike rack on May 5th. But over his dead body! "People here are willing to go to jail if they try to cut one lock on Sunday," Mossey promises. "My neighbors use this bike rack with their children. Citi Bike is going to have to walk through our children and our families to get to that rack. They're going to have to forcibly remove us." ATTICA! ATTICA! As you can see from the photo above, the bike rack in question is pretty packed. Located at the North Wall of the 395 South End Ave building, Mossey says the rack is not on official Gateway Plaza property. "I would love to lock my bike inside Gateway Plaza but there's no room," Mossey explains. "The racks there are overloaded with bikes. It's a complex of six high rises in the middle of a huge construction project, and they have a lot of bike parking already. 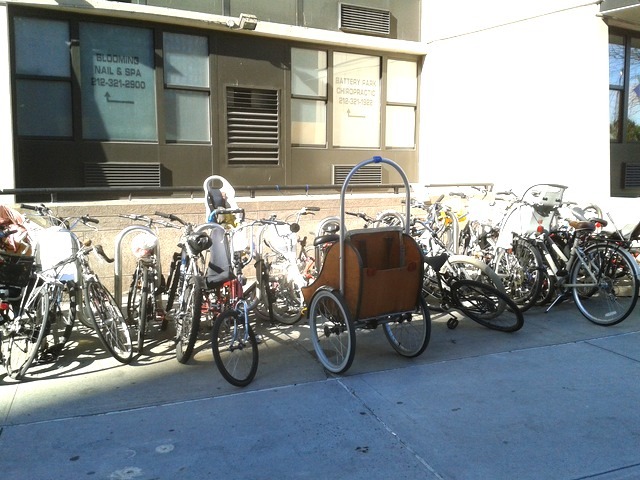 They've made an effort to provide more bike parking, but we still can't all fit." Over twenty residents have signed a petition to save the bike rack, including Manon Chezallerau, a Battery Park City resident for eight years. Chevallerau, who hails from Amsterdam, tells us she's been riding her bike in NYC for 22 years. 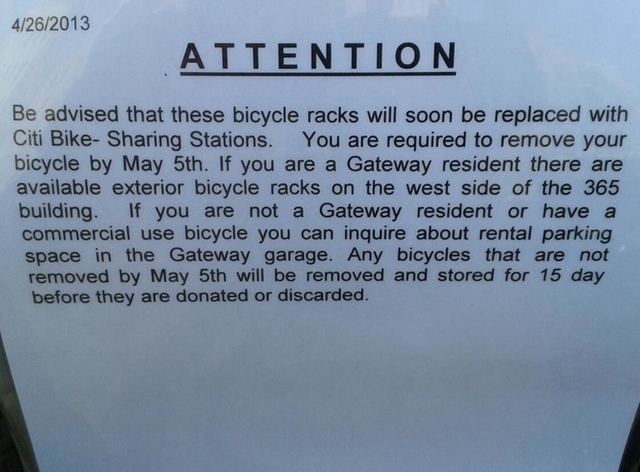 "Given the short notice, I think it's unacceptable to get rid of this bike rack," Chevallerau tells us. "I am for biking and I think the bike share program is fabulous. But I don't think it's right to remove a rack used by so many other bike riders. We don't have enough bike racks on the property at Gateway Plaza, so we're stuck!" Mossey, who's been riding his bike for forty years in NYC, worries the city isn't ready for Citi Bike. "It's complete overkill," says Mossey. "They're doing this without a trial, they're putting too many bikes out, and I don't think drivers are ready for it. Bike lanes aren't set up correctly. It's dangerous out there if you don't know what you're doing. Is the city prepared to do something about the bike lanes and get all the double parked cars out of there? Because that's extremely dangerous!" Mossey says he's tried to call the issue to the attention of the DOT, Citi Bike, Transportation Alternatives, and Gateway Plaza, but hasn't gotten much response. "They're bullying people at this point," Mossey tells us. "You don't take a bike rack away to promote cycling. We don't need Citi Bike. We could have a bike share in Gateway Plaza just with all the unused bikes locked up around here!" 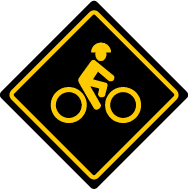 The DOT did not respond to a request for comment [update below], but shorty after emailing the DOT's spokesman, we were contacted by Transportation Alternatives, whose spokesman, Michael Murphy, tells us, "It's a private bike rack. If the management of the building is doing nothing about derelict and abandoned bikes clogging up a rack, that's not really the City's problem—it's an issue between the tenants and their building. "This is also a reflection of the growing demand for bike parking. Obviously tenants expect buildings like this one to provide and maintain that service. I hope more building managers take advantage of this opportunity to attract and retain tenants by making bike parking available and keeping it well-maintained." Update: A DOT spokesman says, "A bike share location is being installed here at the request of the property owner and it is also supported by the BPCA. We understand that they are looking for an alternate location for the rack (which is not a DOT rack)." The Battery Park City Authority did not respond for a request for comment. And so the stage is set for a dramatic showdown on Sunday, when Citi Bike stormtroopers march in to cut the locks, rip out the bike rack and set everything on fire discard the unclaimed bikes. Mossey says he isn't planning to handcuff himself to the bike rack, but he is willing to get arrested "to protect this bike rack," if it comes to that.